The second night of stadium shows at the 2013 CMA Music Festival was a surprise party. Sheryl Crow put in an unbilled appearance, as Little Big Town graciously ceded some time in their set to back the veteran-rocker-turned-country newcomer on two numbers. Meanwhile, Hunter Hayes brought out his version of a pop elder statesman, Jason Mraz, for his closing number, "Everybody's Got Somebody But Me." Perhaps the other headliners, Blake Shelton and Lady Antebellum, were feeling like everybody had a guest star but them. Shelton's better half, Miranda Lambert, had performed at LP Field the night before but didn't stick around for any marital duets. The closest thing to a star cameo for Lady A, meanwhile, was Hillary Scott's unborn daughter, who's suddenly taking up a lot more real estate on stage. Just a few weeks ago, Scott wasn't showing all that dramatically, but now this baby is going to get some serious camera time when a highlights show is broadcast on ABC. The humidity in Nashville this week hasn't let up, but the temperatures have, which Scott — whose first child is due in late July — found to be a literal godsend. "When I looked at the forecast tonight, I was like, this is a direct gift from God to me!" Scott said backstage. "It’s gonna be 68 degrees." By CMA Festival standards, that's a frosty low. Crow was pumped just prior to her on-stage partnering with LBT. "Oh my God. They are just insane," she told reporters. "They’re the greatest vocalists and sweetest people I’ve ever met. I actually know Karen (Fairchild) from my gym, which is a little kids’ place like Gymboree; we take our 3-year-olds there, and that’s how I met her. I was a little bit starstruck!... I love the fact that they toured forever and ever before they finally broke... To me it’s a throwback to all the music I really loved, which were groups that sang really close-knit harmonies, like Fleetwood Mac. And they seriously rock. I love them and value their friendship. They’re good ones." After the show segued from LBT's "Boondocks" right into Crow's "Soak Up the Sun," the interloper finished off their half-hour with "Easy," the single that marks her first official entree into the country radio format, after years of threatening to make the leap. She's ready to do the hard work of being a New Artist, she swore. "I signed with Warner Nashville and they said this is what new artists at country do: they do radio tours. I said I’m on board; I’ll do whatever it takes," Crow said. "My feeling is, I’ve been around for a long time, but the country fan base" is a new hurdle. "That’s one of the reasons I haven’t made a country record before. I was at Interscope and they didn’t have a country division. I’ve always typically written songs that were structurally like country songs, most of them story-oriented songs. And Brad Paisley came up to me after the CMAs when I sang with Loretta (Lynn) and Miranda and said, 'Now will you consider coming home to the format that you belong in?' I said 'I’ll do that — but to me the country format/fan base is sacred territory. I didn’t want to have people perceive that I was kind of jumping on the cool bandwagon. "I have a huge NASCAR fan base," she continued. "We were the NASCAR house band for a long time" — which, in country, of course, counts as a heck of a head start. "And I know the loyalty that exists in country music, and I know the work ethic, and their strong faith. I just wanted people to feel like I authentically belonged. It has been always my feeling that the country fan base will decide if I belong at their format. And I am a new artist here, even though I’m a little bit like Tom Petty, in that" the format has drifted toward rock as much as they've drifted toward country. "Maybe the country format is like the nucleus of Nashville, (where) it’s starting to absorb all the little townships outside of Nashville, where it ultimately (will be) a huge, huge format with Southern rock and traditional country and pop-country like Taylor and Hunter. But I still contend it’s the only place you can hear real songs about real people, guitar solos, people who can really play, and people who write about what it’s like to be a middle American working. So I feel like it’s where I belong, and hopefully people will feel that way when they hear the record." Hunter Hayes discussed how it came about that he released an Encore edition of his self-titled album with Jason Mraz now joining him on a re-do of "Everybody's Got Somebody But Me." "We actually met at the Grammys, and I introduced myself. Hopefully I didn’t stutter too, too much because I am a huge fan," Hayes recounted. While suggesting that maybe the two of them could write together in the future, "I also brought up this song and kind of snuck it in… I was always curious to see what Jason would do to something like this… I don’t know how the whole thing happened, but the next thing I knew I had tracks in my inbox, and it was vocal tracks from the one-and-only. It was cool to get that totally new life for the song and totally new perspective. The song has a whole new meaning in my opinion now, and it's perfect for the encore." Mraz said he didn't think much about the "crossover" aspect of the collaboration. "Musicality draws me to the artists first and foremost. And what I find in this genre is an intense musicality, especially from the songwriters who can dig into their instruments and dig into melody and dig into story and dig into spirit. I dig on that," Mraz said. "And then second is the community that they surround themselves with. It’s really inspiring. A lot of us in the pop scene live in our own bubbles and we don’t get to interact with each other too much. And it seems like on the west coast (that we're) just too far away from this community out here. 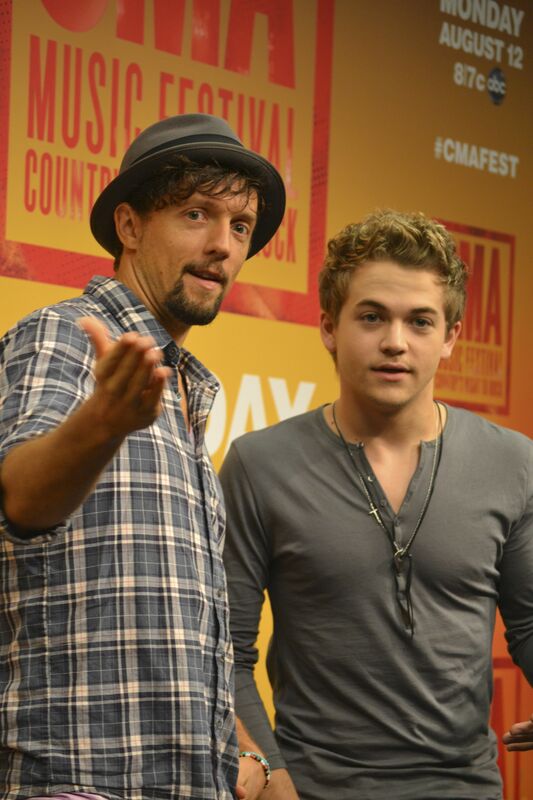 So it’s a real honor, whether it’s Zac (Brown) or Hunter, to be considered and to lend my voice to what they’re doing." 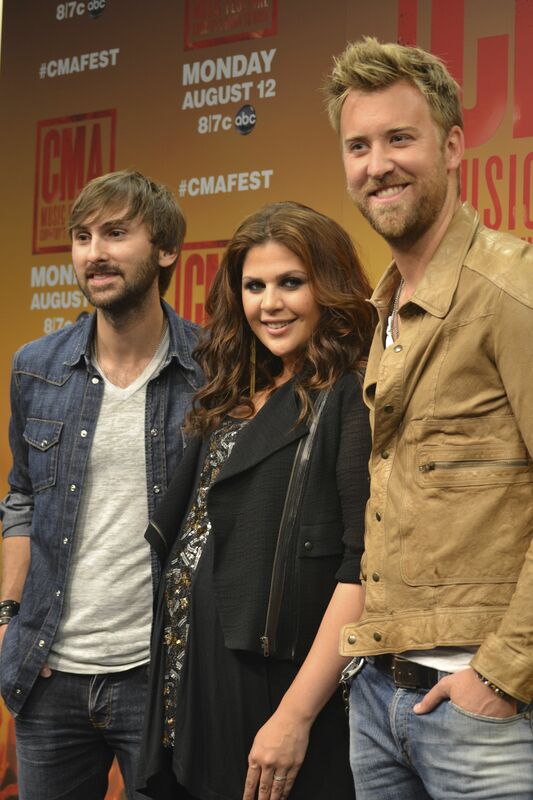 Lady Antebellum are looking at their last three gigs before Scott takes maternity leave. When the boys were asked what they'd be doing during the time off, Scott blurted, "Helping me!" But seriously, non-babysitting folks... "We’re gonna write some," said Charles Kelley. "We’ve already been talking a lot with our buddies — Luke Bryan, Blake Shelton, Miranda — about getting out on their tours and writing some with them. But on the flip side, we’re gonna be honestly preparing for some of the future shows. We’ve got some things in the works. And once my girl here" gets back on her feet, "we’re gonna try to obviously get back out on the road and promote (the just-released new album). And then, when her little girl is old enough, I’m gonna sign her to a record store and make her a big old star, and I’ve got exclusive rights." Scott said the fans they've run into during the week have "been so kind, honestly, giving gifts, whether it’s little cute stuffed animals for a daughter or onesies or little socks or little keepsakes. It’s really sweet." "You’ve gotten way more gifts than Dave and I," said Kelley. "One of us is getting pregnant, Dave." But when she was first asked what she'd gotten from fans this week, Scott responded, "This, a lot of this" — rubbing her protruding baby like a genie's lamp. "She loves this," said Kelley, sarcastically, doing his own demonstration of invading Scott's personal space. "'I just met you! I’m rubbing your belly!'" The second night of shows at LP Field ended up running on the late side, with Shelton taking the stage more than an hour past schedule and finishing up his set at about 12:15. Given the number of acts squeezed onto the bill, there were few fan complaints, much less early exits. "I wasn't sure you were going to hang out for me," Shelton told the still-boisterous crowd as the clock approached midnight. "What the hell was I thinking?"